For lunch we finished a panini roll and filled it with Swiss and some fo the (yet still) remaining Soy Chili. The soy chili has been fully costed across the six meals we’ve already had from it, so today (and any more) it costs nothing. It turned out well for 97c per serve! Traditionally we did the “Irish” Dinner on Foodie Greg’s birthday, but this year we delayed it until the night before St Patrick’s Day. 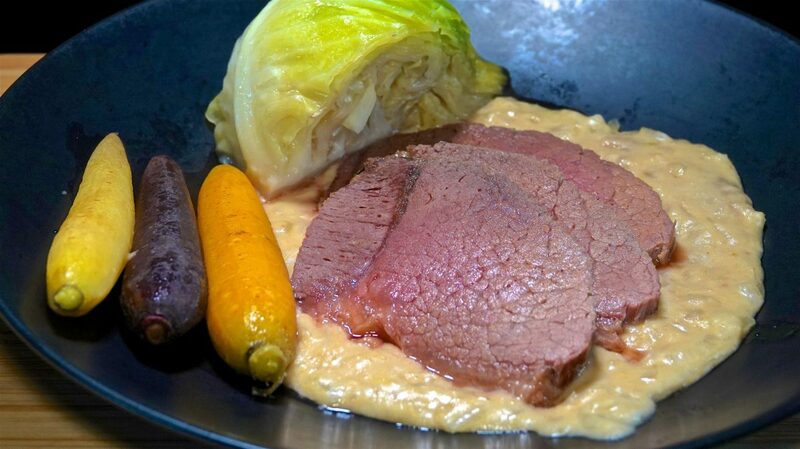 We served the top round corned beef, which we prefer over brisket, with carrots, cabbage and an onion sauce. Add 20c for flour and onion. We always enjoy this meal, which we can only get around St Patrick’s Day. Tonight it cost $8.18 per serve.